A ripe, juicy apple contains substances than can help you pass firm stools more regularly. The fiber contained in an apple can add bulk to material in the bowel. In addition to helping your bowel movements, apples provide vitamins such as A and C and the minerals potassium and phosphorus. Eating the apple core and the apple skin adds extra nutrients and more fiber. Dietary fiber plays a key role in the health of your bowels and the shape of your stools. A diet low in fiber may result in more watery or loose stools. Similarly, choosing snacks high in fat instead of an apple could lead to hard-to-pass compact stools. Fibrous foods help bind bits of partly digested food together in the small intestine as it moves along to the colon. However, at the same time, fiber draws water to the stool to make a more moist mass that passes through without discomfort. 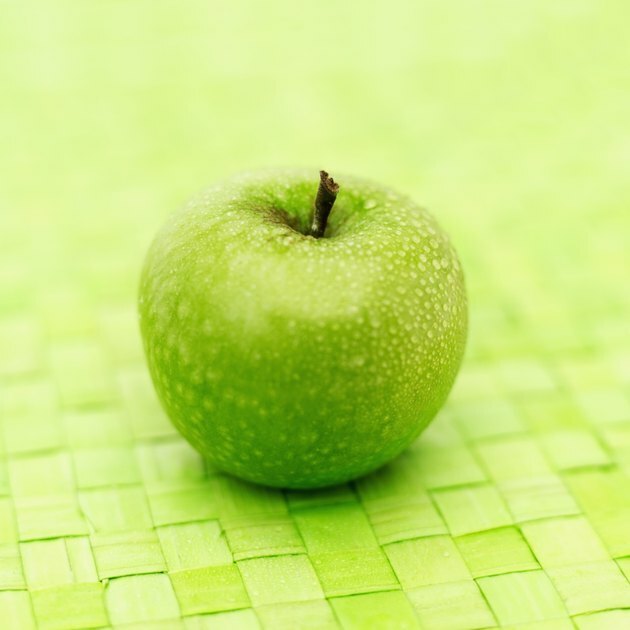 One large apple contains around 5 g of fiber, mainly in the form of pectin. This gives the apple some of the highest fiber content of all the fruits. For example, a large banana contains around 4 g of fiber, a large orange 4 g and half a cup of strawberries only 2 g of fiber. The apple fiber content help keep your stools regular, firm and moist. However, make sure you eat the skin as well as the apple pulp. The apple skin contains around two-thirds of the available fiber as well as useful antioxidants. The average person should aim to consume around 20 g of fiber per day, according to Georgia C. Lauritzen, PhD from Utah State University. That means that four large apples would provide all of your minimum daily fiber requirements -- though you may not want to eat only apples every day. This amount of fiber should offer enough fibrous material in the bowel to help maintain stool shapes. Some people have bowel conditions that may prevent them from eating high-fiber foods such as whole apples. For example, a person suffering from Crohn's disease may find that an apple has a negative effect on his stools. This could be because the gut lining becomes irritated, discharging mucus or otherwise creating a loose stool, or even diarrhea. If you have a gastrointestinal problem, speak with your doctor or nutritionist about whether apples would make a wise choice for your diet. Are Carrots Good for Bowel Movements?